One thing that I find about writing this Blog, is reporting on all the unpleasant things that are happening in our country; our communities; at this very moment. Whether it’s high unemployment; pollution in our rivers and coastline; constant attacks on welfare beneficiaries; racism; cutbacks in our social services; the growing gap between the wealthy and the poor; a rather nasty anti-union campaign on Auckland’s waterfront… after a while, I can fully understand why 100,000 of my fellow New Zealanders shipped off to Australia. Half the time I wonder why I’m still here. Anyway, every so often, there is a ray of sunshine that pokes through the gloom of bad news. Like this one, the story of Ms Jazmine Heka. She’s 16 years old. And she has more compassion and wisdom than half the adult population in this country. She certainly shows greater awareness than our current batch of political leaders. Because Jazmine Heka, at age 16, and when other young women her age are out flirting with post-adolescent boys with acne and over-powered cars, is different. Jazmine watched Bryan Bruce’s document, Inside Child Poverty – and came away disgusted; angry; and confused as to how something like this could be happening in our own country. And well she might; New Zealand was supposedly a wealthy country with an abundance of food and resources. What has gone so terribly wrong? Jazmine’s response to the documentary was perfectly normal. Any sane, compassionate, person would have viewed Bruce’s documentary about our crisis in poverty, with similar feelings of outrage and disgust. Those that viewed it – and simply shrugged it off – did so because they have become inured to life’s hardships and uncertainties. For many of us, poverty and other social ills have become a normal aspect to everyday life. For many well-off, middle-class folk, poverty is “somewhere over there” and “beyond our ability to deal with“. For many of us, we have “normalised” poverty; inequality; poor housing; lack of food; lack of adequate incomes; and lack of hope. Those living in poverty live the same “train wreck” of their lives; day-after-day; week-after-week; their families; their community – and no hope of ever getting out. For these families, a life of poverty is also “normalised“.It’s all they’ve had and all they are likely to ever have. Meanwhile, products and images of products of a wealthy, consumerist society is all around these poverty-trapped families. Eventually, those who suffer such hardship cannot cope any further with the constant stresses, of their dismal lives. Some cease to care. Others lose themselves in anger, fueled by cheap, plentiful alcohol and drugs. Brutalised beyond any measure of comprehension by Middle New Zealand, they commit acts of self-harm and violence to others that the rest of us find inexplicable. Try to explain to Middle New Zealand why a bunch of young people would torment an infant until it died from it’s injuries and internal bleeding – and you’d get a blank look. Or, most likely, it is blamed upon the parent(s) and immediate family for abusing to death their child. Only then do we, as a society, take an interest in that family, as they are put through the Court system; paraded on our television “news” each night; and we shake our collective heads in dismay and wonder what kind of “animal” kills it’s own young. A stressed, abused, mal-treated “animal” – that’s what kind. When things go terribly bad in poverty-stressed families, it is not the start of a crisis – it is the end-result; a culmination, of years of living in squalid conditions that few of us have ever experienced. That is poverty. Or, at least, a visible part of it. Most families survive. Even our Prime Minister grew up as a child to a solo-mother in State House. Of course, John Key not only had a state house over his head, but had the benefit of a free, tax-payer funded tertiary education. That’s right folks. Mr Key went to University prior to 1992, before student fees were introduced. He may even have had access to a student allowanvce that was commonly accessible those days. And his mother didn’t have to pay for prescription medicines – those were free, before Rogernomics came into play. State house. Free education. Free prescription medicines. That was all replaced with User Pays. National sold off about 13,000 state houses in the 1990s. And medical care became more and more expensive. At the same time, taxes were cut seven times since 1986; gst was introduced; and User Pays and higher government charges made living more and more expensive for those on low incomes. As the economy was de-regulated in the late 1980s, factories that had once employed locals to produce locally made goods closed down – and instead we had them produced and imported from China, India, Pakistan, Vietnam, Fiji, and other low-wage economies. In return, we got cheap shoes from China – and growing poverty in New Zealand. Most unfair of all, it is children growing up in poor families that bear the brunt of our 27 year old free market economy. It’s not hard to see who benefitted most from seven tax cuts in the last 26 years. In turn, Fonterra plans to re-introduce milk in low-decile schools – something not seen in New Zealand since 1967. A return to school milk seems indicative where we have arrived as a nation: full circle since 1937, when free milk was first introduced in schools throughout the country to fight poverty’s effects on children. And here we are – back again. But it’s even more of a harsh reality now. On 4 February 2007, you released a Press Release headed, “National launches its Food in Schools programme”. As outlined in Bryan Bruce’s document, “Child Poverty”, there is a growing problem of poorly fed, malnourished children in NZ. Could you please advise what progress your government has made in the area of providing meals for children in low-decile schools? This issue is a critical one. Poorly fed children do not do well in the classroom, and this results in difficulties further along in their lives, including social dislocation; poor education; unemployment; and more expensive interaction with government services. I’ve received an acknowledgement and that the email was passed on to Education Minister Hekia Parata. But nothing further. This, to me, is why it is so important that good men and women like Bryan Bruce, Jazmine Heka, Kidscan, Child Poverty Action Group, etc, raise our consciousness on these matters. These problems will not go away by themselves. They must be resolved with planning, determination, and money. But more importantly, Bryan Bruce and Jazmine Heka need our collective voices to aid them, and to back them up. Bryan and Jazmine and many others are working to fix a problem that should never have been allowed to grow and fester. But it’s here now, and we have to deal with it. “The government has prioritised a number of policies to stimulate the economy in an effort to get us out of the current recession. None of these policies, to my mind, tackles head-on the most urgent task of all – eliminating ‘child poverty’. And the year before that, in 2010, the collective anger of New Zealanders stopped the National government dead-in-its-tracks to mine on Schedule 4 Conservation lands. I believe that with the same support for Bryan, Jazmine, and other community groups fighting poverty, that this government can be made to pay attention to this problem. I believe that, acting together, there is no reason why we cannot achieve our common goal of beginning to solve this growing crisis in our communities. None whatsoever. So let’s help Jazmine to help New Zealand. Snailmail: PO Box 585, Whangarei 0140. Articles and photos by Simon Oosterman. Hi-res photos are available here. Please feel free to distribute. The media have given plenty of space to Ports of Auckland management, but nobody has canvassed the opinions of those most affected by the company’s decisions, the workers. 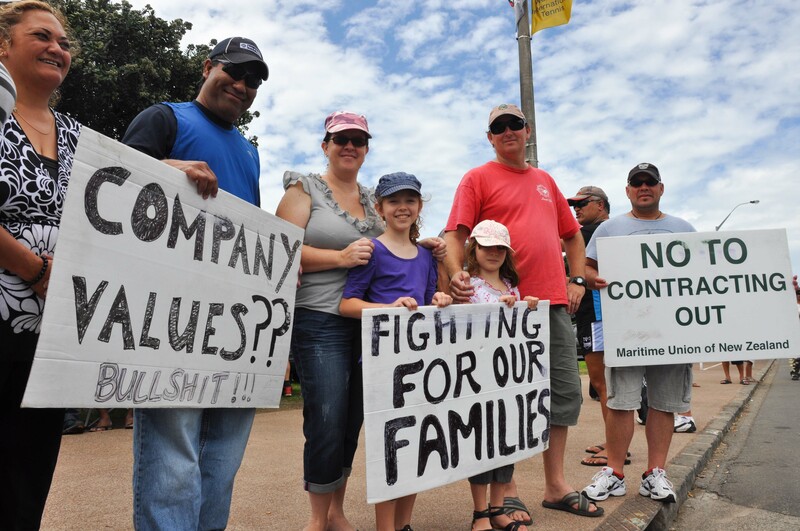 Here we get behind the news to the men, their wives and the children affected by the Ports of Auckland actions and proposals. For the background to the dispute read the Maritime Union of New Zealand and Council of Trade Union fact sheet and the Port of Auckland’s industrial dispute updates. Leah interrupts: “and for the marriage”. 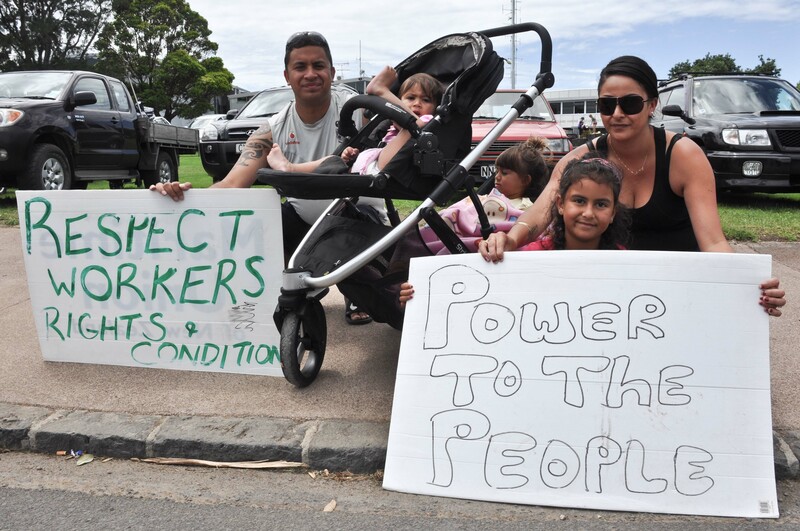 “It’s clear from the ports casualisation plan that they want drones, when we are actually parents. You can’t sustain a family as a casual and deal with the everyday stuff parents have to put up with. One of our kids has a chronic illness and another is getting progressively deaf in one ear. I should be able to count on partner to help out with hospital visits and specialist’s visits. “Everyone complains about irresponsible teenagers going out on town and they wonder where their parents are. They are hereThe Wallace family: “It’s not just husbands affected, it’s our families too” and in other unsociable jobs. The only other option to this work is working on the minimum wage. Mark Wallace is a stevedore at the Ports of Auckland. He worked his way up from a casual to a permanent crane driver over 18 years. Mark and wife Katrina have two children, Ashley (9) and Rebecca (7). Katrina, is a self-employed dress-maker who works from home. “I’m doing this for my family and my mates,” he says. “A 10% pay rise isn’t worth the new casual roster system – family time is more important than a pay rise. Destiny says Jermaine doesn’t see his kids because he leaves for work at 5:30am and gets back at 11:30pm. 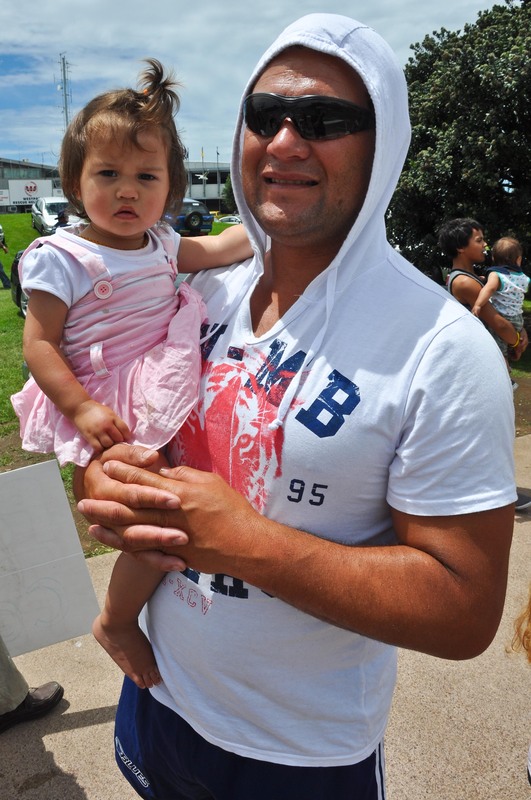 Brandon Cherrington, 38, has worked at the Ports of Auckland for 1½ years. He is a permanent part-timer and is only guaranteed 24 hours a week. Brandon has a 1½ year old daughter. 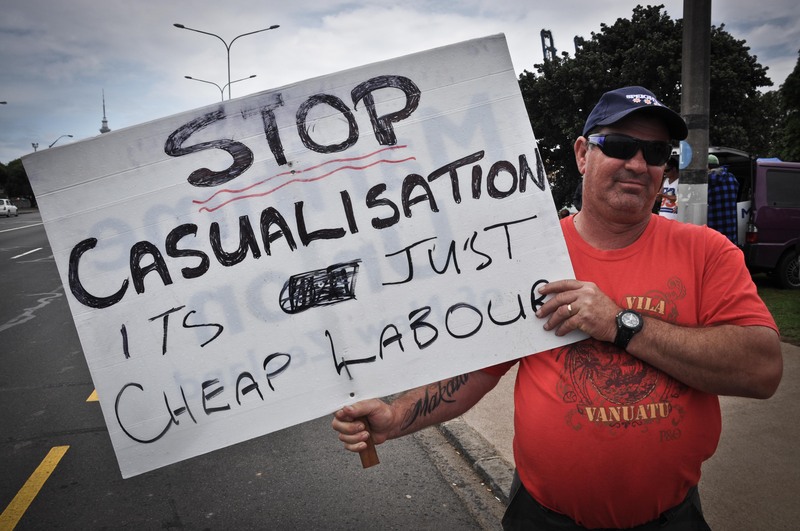 Shaun Osbourne works at the Ports of Auckland. Because he is a casual employee, he hasn’t had a single guaranteed hour in the eight years he has worked there. 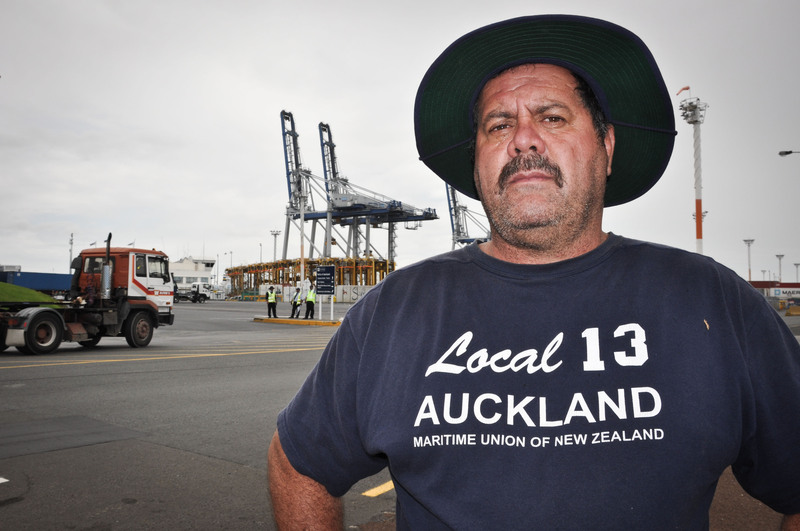 Wayne Wolfe, 58, works as a stevedore at the Ports of Auckland. He has worked on the ports for 35 years. Wayne has three adult children and two grandchildren, including a two-week old baby. Wayne is an executive member of Local 13 of the Maritime Union. 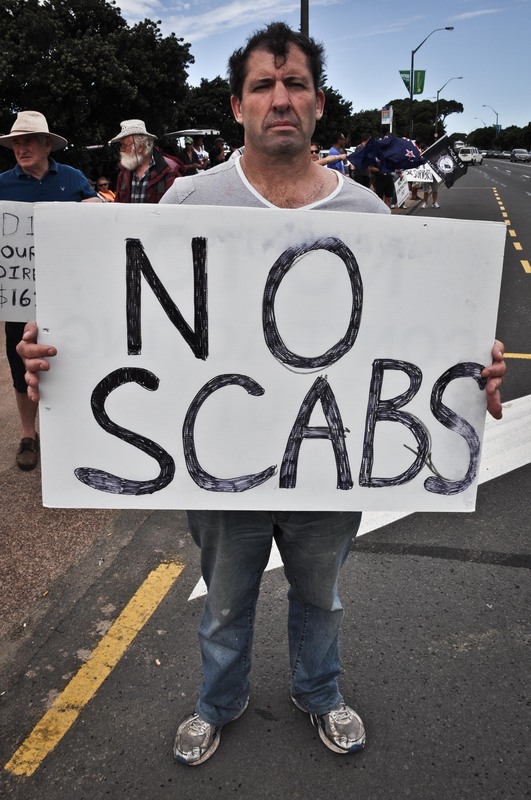 Ron Bell, 53, is a stevedore at the Ports of Auckland. He will have worked on the waterfront for 31 years this coming April and has been union since he was 17. He has four daughters Jac (20), Katherine (18) and twins Samantha and Amanda (15). 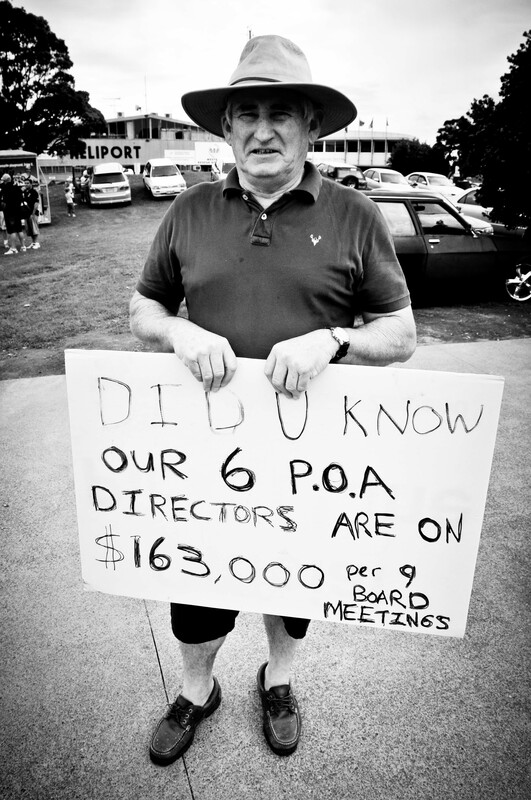 He is an executive member of Local 13 of the Maritime Union. Ken Ziegler, 49, has worked as a stevedore at the Ports of Auckland for 12 years. Ken is the main provider for his son Carlos (10). He is an executive member of Local 13 of the Maritime Union. 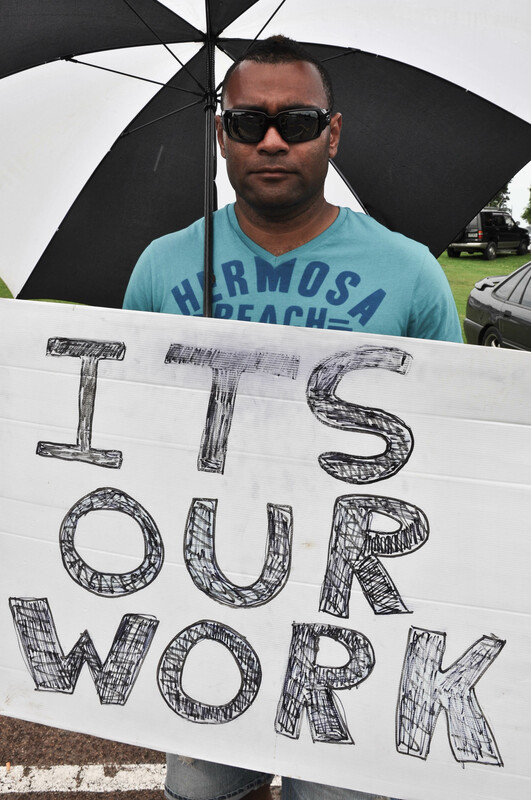 Napo Kuru, 27, has worked as a casual lasher at the Ports of Auckland for four years. “Peter Thomas Mahon was a New Zealand High Court Judge, best known for his Commission of Inquiry into the crash of Air New Zealand Flight 901 (“Mount Erebus disaster”). His son, Sam Mahon is a well-known artist. Mahon began his legal career with the Raymond, Donnelly & Co. He was mentored by Sir Arthur Donnelly. Mahon was junior counsel for the prosecution in the Parker-Hulme murder case in 1954. After the crash of Air New Zealand Flight 901 with loss of all aboard on 28 November 1979, an accident report was released by the chief inspector of air accidents, Ron Chippindale, which cited pilot error as the chief cause of the accident. Public demand led to the formation of a Royal Commission of Inquiry into the accident, consisting solely of Mahon. He produced his report on 27 April 1981, which cleared the crew of blame for the disaster and found that the major cause was the reprogramming of the aircraft’s navigation computer without the crew being notified. Mahon controversially claimed that Air New Zealand executives engaged in a conspiracy to whitewash the inquiry, covering up evidence and lying to investigators, famously accusing them of “an orchestrated litany of lies”. His book, Verdict on Erebus, an account of his inquiry, won the New Zealand Book Awards prize for non fiction in 1985. Mahon retired from the High Court bench in 1982. In 1983 the Judicial Committee of the Privy Council held that Mahon had acted in excess of his jurisdiction and in breach of natural justice by going on to make findings of a conspiracy by Air New Zealand to cover up the errors of the ground staff. In 1985 Mahon was appointed as Commissioner of Inquiry into the 1984 Queen Street riot. In the same year he published “Dear Sam”, a collection of his letters to his children. “Justice Peter Mahon accused Air New Zealand of an “orchestrated litany of lies” in his finding on the cause of the crash of the DC10 aircraft on Mt Erebus on November 29, 1979, which killed all 257 passengers and crew. In his report released in 1981 he said DC10 pilot Jim Collins was not told of a last-minute change to the flight path co-ordinates, and neither he, First Officer Greg Cassin, nor the flight engineers, made any error which contributed to the disaster during a sight-seeing flight. Air NZ challenged Justice Mahon’s accusation of a “predetermined plan of deception” and the Court of Appeal overturned the finding, saying the judge had exceeded his terms of reference. 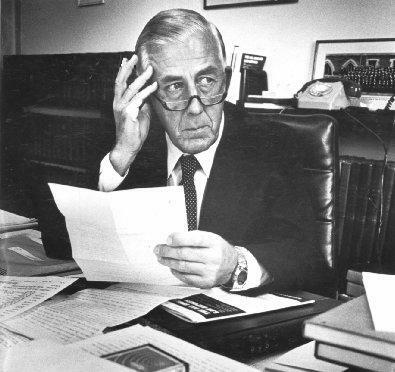 Justice Mahon resigned, and died in 1986 but his comments echoed around the world. Now the New Zealand Airline Pilots Association (ALPA) said it would posthumously present Justice Mahon with the Jim Collins Memorial Award for exceptional contributions to air safety. … Justice Mahon found a navigation computer had been incorrectly changed so the plane was programmed to fly into the mountain, and that Air New Zealand witnesses had lied to cover up other mistakes that pointed blame at the carrier. “… Successive governments refused, year after year, to officially recognise Justice Mahon’s accident report which overturned the assertions, made by the Chief Inspector of Air Accidents Ron Chippindale, that the pilots were culpable. With unassailable logic, Mahon proved him wrong. Justice Mahon’s report was eventually tabled in Parliament and became an official document in mid 1999, thanks to the efforts of Hon Maurice Williamson. Justice Peter Mahon. He arrived at the truth surrounding the Erebus Crash in 1979 – but it was an Inconvenient Truth, and it upset many powerful people in high places. The highest, it might be said, was the authoritarian Prime Minister of the day, Robert Muldoon. Armed with nothing but his integrity and the truth he had uncovered, Justice Mahon stood against them all. I believe he will be remembered as one of New Zealand’s finest, most heroic people. R.I.P. Peter Mahon, for you were an Honourable Man. 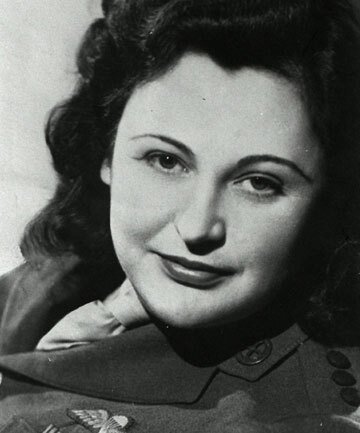 Wellington-born WWII heroine Nancy Wake has died in London, aged 98. Ms Wake, who was born in Roseneath but left New Zealand as a toddler, was living in France when Nazi Germany invaded during World War II. She joined the French Resistance and was smuggled to England for specialist training. She was the Allies’ most decorated servicewoman, collecting bravery awards from France, England, Australia and the United States. In 1944 she was parachuted back into France, where she co-ordinated the efforts of thousands of fighters and fought alongside them. Ms Wake – codenamed the “The White Mouse” because of her ability to elude capture – at one point was No 1 on the Gestapo’s most wanted list, with an offer of five million francs for anyone who reported her or killed her. The Daily Telegraph reported that Ms Wake died yesterday in a hospital in London, where she had lived since 2001. 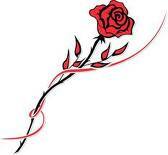 A close friend confirmed Ms Wake’s death early this morning. She was recognised locally last year with a new “heritage pylon”, unveiled by former Wellington Mayor Kerry Prendergast in Oriental Pde. Rest in Peace, White Mouse.